Day One: thinly peel the lemons with a sharp paring knife or vegetable peeler, taking care to avoid the bitter white pith. Combine the peels with the brandy and rum in a jar and let it sit for 24 hours. Juice the lemons (and run the rinds through the garbage disposal; they’ll make it smell nice). You’ll have more than you need for the punch, so save the rest for other cocktails. Day Two: strain the peels out of the brandy and rum. (Citrus peels will turn spirits very bitter if they infuse for too long.) Add the lemon juice and sugar to the brandy and rum and stir until the sugar is dissolved. Grate the nutmeg and break up the cinnamon stick and star anise into the mix. Then, bring the milk to a boil in a big pot. As soon as it is boiling, add the spirits and lemon juice mixture. Stir a bit to melt any remaining sugar. Turn off the heat and watch the milk curdle into a big, gross mess. Let it sit, covered, for at least two hours. Then, using lots of cheese cloth (or, as in Ben’s original recipe, a Jelly-bag, whatever that was), strain the milk solids out of the punch. Working in small batches, run the punch through the cheesecloth, which will clog up quickly. Change out the cheesecloth frequently, taking time to squeeze out as much liquid as you can from each batch. What’s left will still be pretty cloudy, so you can handle the next step a couple of ways: you can let it sit overnight so the solids settle to the bottom and then carefully decant the punch into another container, or you can do what we did: strain everything painstakingly through a coffee filter. We used our Chemex coffee maker. It takes forever, but what comes out will be crystal clear and you won’t lose any liquid in the dregs. Got all that? If you’ve made it this far, and survived the curdling, then you’ll be left with a crystal clear, amber-hued liquid of sublime flavor and texture. Clarified milk punch is dark and smooth, with layers of citrus and hints of spice. It’s also silky and smooth in a way that no other drink is. By letting the lemons’ acidity curdle the milk solids, you’re really just using the whey – sugar, in the form of lactose; proteins; and almost no fat. The result is an unctuousness that’s surprising the first time you try it. This is definitely an old drink. 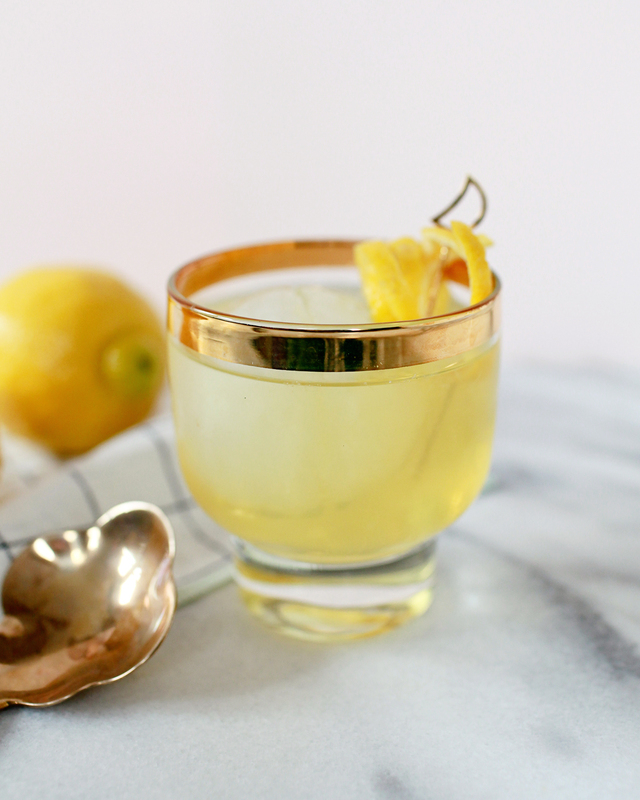 Even people who have enjoyed classic cocktails before will probably be surprised by clarified milk punch. And not just its texture: this punch almost seems like a showcase for citrus, with all the lemon juice and lemon oil in there, and exotic (at the time) spices. Which makes sense: in the 1700s, citrus was a fairly rare treat. And spending two or three days making a single punch will definitely remind you of how different life was back then, when people actually had time to make and enjoy a bowl of punch like this. So it’s odd. Delicious, but odd. Some logistics. This recipe makes about a gallon, so be prepared with a large bowl and some thirsty mouths to help you drink this down. (And this is a short version of Ben Franklin’s original, which made about four gallons and used 44 lemons (!!). Serve it over ice; if you’re serving from a bowl, put the biggest block of ice you can fit into the bowl. No need for a garnish, since it has all that spice and lemon oil in it, but it won’t hurt if you want to make it pretty. And because it’s clarified, it will keep in the fridge, so keep some swing bottles handy to save any leftovers.